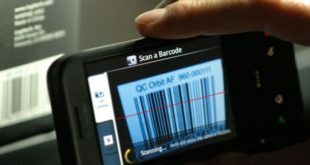 The smartphone comes with lots of features, and Navigation system is one of the important function. Many of us use a navigation app daily. For our daily life, we use the app to find out so many things. If you want to go somewhere unknown?? You need a navigation app. If you lose your way, navigation app can rescue. Navigation app helps to find our way, give us the traffic details; we can share our location, we can add a location. 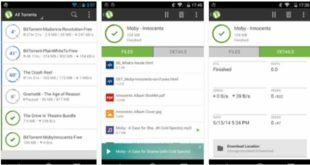 All things considered, we are going to tell about the 10 Best Navigation App for Android Devices. When we think of a navigation app, firstly comes the name Google Maps. Apart from Google Maps, there so many navigation apps available on Google play store. For this reason, we are giving you some of the best navigation app suggestion. No doubt, Google Maps is one of the Best Navigation App for Android Phones and Tablets. The beast is full of features, which made it the first choice. The best part of this app is, it’s get updated in every day. And that’s why you can find anything via this app. 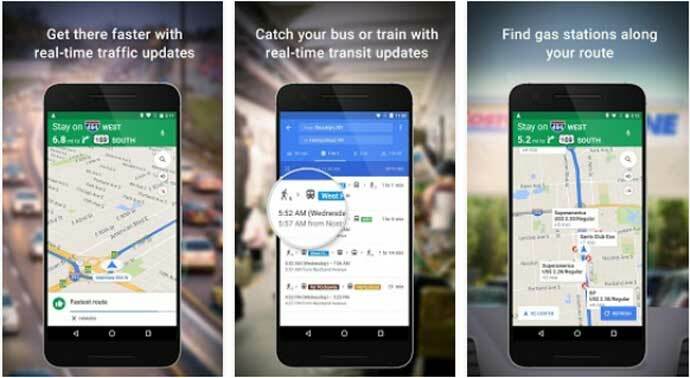 Fast and real-time navigation for, route, places, bus, train or ride. You can see the reviews, rating, and pictures to go for a food place. The real-time navigation will help you to beat the traffic. Google Maps has offline search option so that you can get directions and use navigation without an internet connection. You can also save the offline areas. Waze is another Best Navigation App. Waze is another Google-woned Navigation app. This is the largest community-based traffic and navigation app. The user can share ETA updates on Facebook, and live rout-tracking to any contact. This social sharing feature allows its user to share or report construction, police update, accident, cheap route, road traps and others. For this reason, it adds a lot to the driving experience. You can get turn-by-turn voice guided navigation by this app. You can also get the automatic rerouting as a conditions change on the road. HERE WeGo – Offline Maps & GPS is one of the simple Navigation app that available for offline use. You can get each and every detail about your route, even how flat or hilly your bike ride will be. The app mostly compatible with the car. The user can check nearby transport and can book a taxi. It also gives the notification about the total cost of public transport. It has more than 1,300 cities public transit. 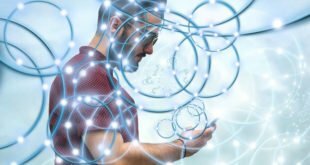 Use navigation without an internet connection by HERE WeGo. You can find the stuff you need nearby. 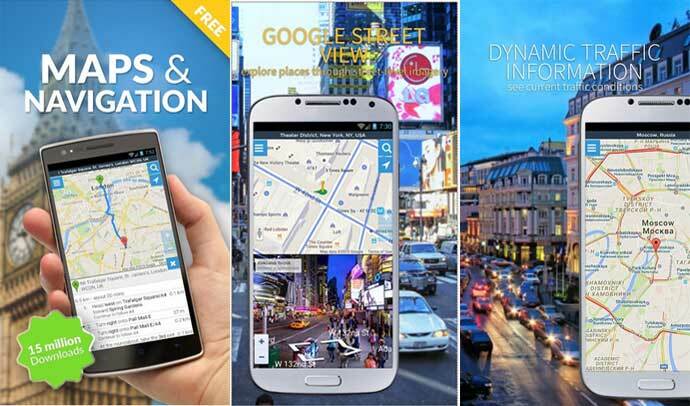 Sygic is another Free Android Navigation App with more than 500 downloads. 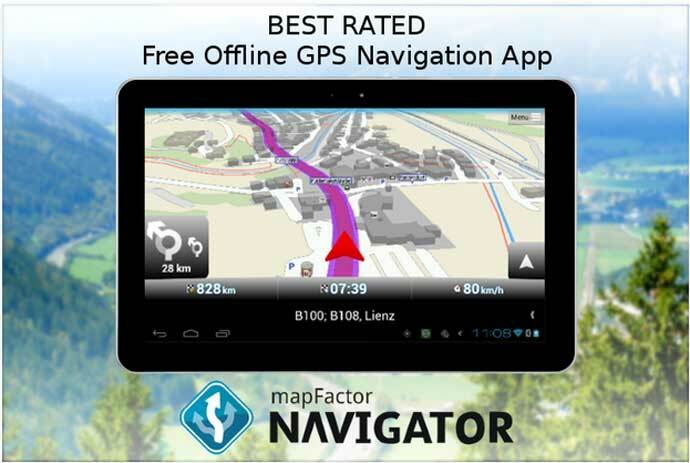 It is the most downloaded free navigation apps. It has some unique features, like 3D offline maps. The user can have route to route guideline without an internet connection. Real-time traffic help to avoid a traffic jam. Information about police radar, speed camera to save your time and money. It also helps to find out the cheapest gas, parking lots, etc. 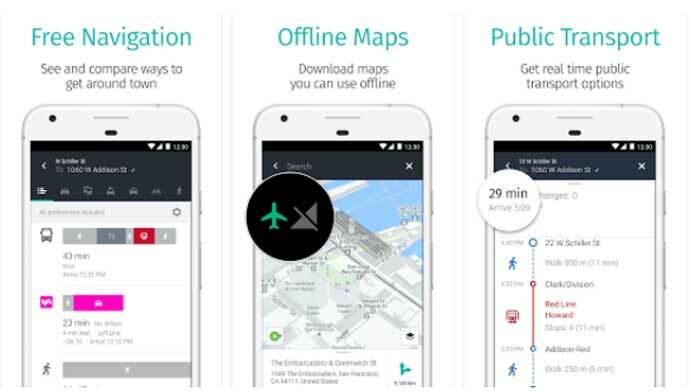 MapFactor is another turn-by-turn free navigation app for Android. 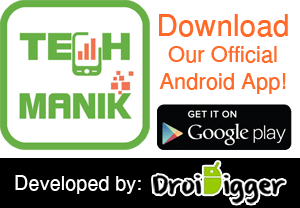 Main features of this app are voice guidance with various language, door to door route plan, 2D and 3D mode, day and night mode, maps rotating system, etc. The user can add their favorite location. On the other hand, you can have the information about restaurant, hospital, college, gas pump, public transport, etc. To go anywhere feel free to use MapFactor. 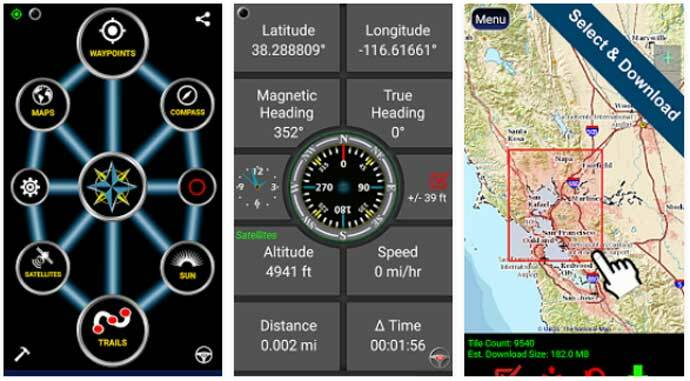 Another best navigation app for your Android smartphone. Sometimes showing ads interrupt the task we need, or we want, and there is Maps.Me offering you their service without ads. Offline areas, worldwide available, fast and reliable, tension free memory. This app has some amazing feature like you can bookmark a place for your future visit, everyone from anywhere can directly edit and add the route to the app. This app can remember favorite places you visit frequently. Light, fast and simple Navigation app you can have is right here. CoPilot is one of the best navigation apps for Android, especially for drivers. It has been made for drivers who need a route-to-route map with voice guidance. The 2D and 3D mode will give the actual direction for your comfort driving. This app has the premium version, but if you are not interested in purchasing you can also use offline routes. 2D is available for any user. Powerful trip planning, clear directions, reliable offline maps are available in CoPilot. It also has the social networking sync feature. Polaris is offering you the world no 1 all-purpose GPS. You can go anywhere with Polaris, even there are no roads. Polaris has a unique feature. It comes with a built-in compass which can use for directions. It provides a powerful GPS navigation system, Hiking GPS, Trail recorder, Sailing, and Boating. 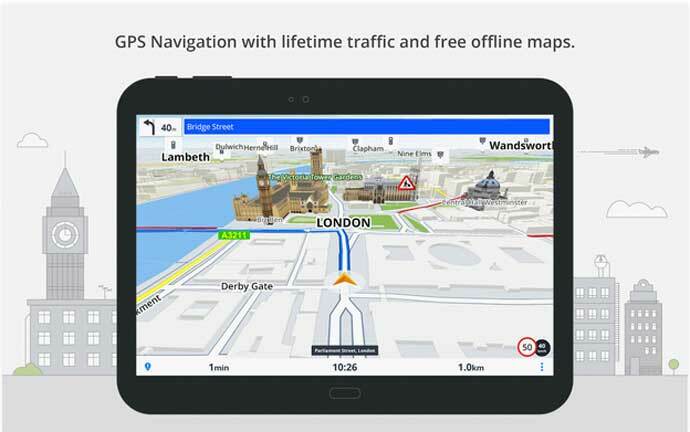 Maps, Navigation and Directions is another best navigation apps for Android lovers. For a better service, it includes information from Wikipedia, videos from Youtube. User can also have street view and weather forecast. Route planner for trip, ride, and biking. You can find out the fastest trip route with the help of local traffic. Most trusted map and voice for step-by-step travel direction. You can track location via GPS. Finally, we are at number ten with Maverick. Simple and useful navigation apps with all basic and some unique feature. As usual, the user can have all access to this app without an internet connection. Sharing is caring, so you can share your location or personally send to your beloved one. Build-in radar for showing direction and point of interest. Simply save and record the tracks with one tap. For your daily life, you need a strong enough Navigation app. 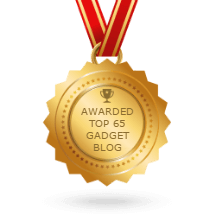 All things considered, our expert recommends you the Best Navigation App for Android Devices. Download and enjoy your navigating. The free and offline mode is the best option for these apps.